Come enjoy our big garden with plenty of space to enjoy a drink, play french 'petanque', tennis table or pool or just take a sunbath on our 500 m2 wooden terrace! You'll get specials discounts on drinks and food at our bar, the famous Woodstock Garden ! We also serve food such as falafels, budha bowls, burgers : all cooked with fresh products from the market. Annecy is a old city with one of the purest lakes of Europe, surrounded by mountains that offers plenty of activities. Annecy is the capital of Europe for outdoors sports activities that’s why we developed partnership with outdoors companies so you'll get discount on bikes rental, paragliding, canyoning, kayaking and so much more ! You can also enjoy the old town which is surnamed the 'Venice of the Alps' and by night, discover all the restaurants and pubs the city has to offer! The Pink House has 3 rooms including one with a balcony. 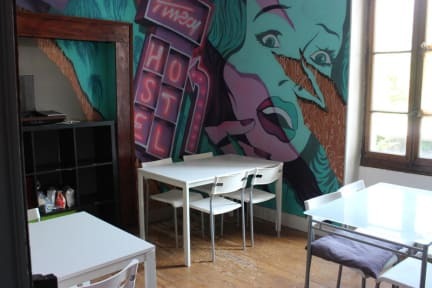 Street artists painted the hostel and it’s really colourful ! All linen is provided, beds as well as private lockers (40cm x 40cm) to put your personal belongings. We make the bed before your arrival. You can buy a looker at the reception. The rooms are being cleaned every morning. NOTE: Reception open at 9:00 am. Check-in is at 3 pm (as the rooms are being cleaned) but of course you're welcome to leave your bags with us until then, chill out & have a drink! Reception from 9 am to 11 pm.